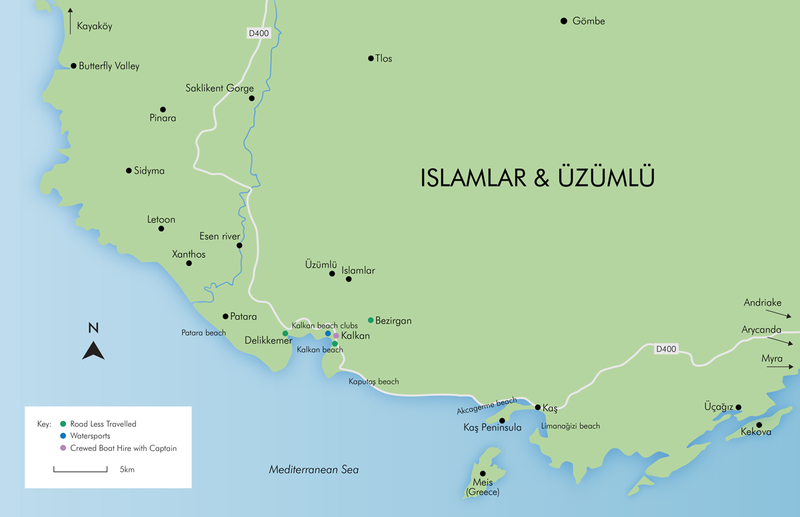 Sharing many of their attractions with nearby Kalkan, Islamlar and Üzümlü are very much the quieter cousins. Nestled high in the foothills of the Taurus Mountains, the villages have always been places of retreat that offer solace from the intense summer heat and the pace of life in the busier worlds by the coast below. Within the villages, you’ll find life moves to its own rhythm, changing with the seasons and focused on agriculture rather than tourism. Tireless traditions, renowned hospitality and unbeatable views across fertile valleys to the distant white sands of Patara make these two villages more than worthy of a day trip, if not the chosen base for your holiday. They may be small, but Islamlar and Üzümlü sit in a dramatic landscape with a grand history. Between soaring mountains and the impossibly blue Mediterranean Sea, the Lycians set up home, an ancient people whose tombs dot this rugged landscape and the remains of their magnificent settlements can still be found at many a turn along many a trail. The best known is the scenic Lycian Way – a 310-mile tying together of goat tracks and timeless paths, traversing deserted beaches, lush forests and soaring peaks for unforgettable walking in spring and late summer. Islamlar is Turkish countryside living at its beautiful best. A place where the tea gardens are somehow a touch more tranquil than elsewhere and where pools fed by natural spring water are brimming with trout of such quality, the village’s restaurants are justly famed for miles around. However, for a livelier take on the abundance of fresh local produce, Kalkan, just a 15-minute drive away, has given a vibrant spin on traditional Turkish feasts, its famous rooftop restaurants and laid-back harbourside dining accompanied by colourful cocktails and the music of Ibiza sunset bars to accompany your meal. Being so close, Kalkan deserves some (well-earned) attention. 200 years ago, traders from the Greek islands of Rhodes and Meis made this pretty town in the bay a post from which to trade, amongst other things, silk – and mulberry trees, the residence of choice for silk worms, continue to dot granite-paved streets in sophisticated memory of the past. Today, the trading continues in Kalkan’s bustling weekly markets and the boutiques that line the town’s narrow winding streets – a treasure trove of ‘genuine fakes’, leather handbags, summer clothing and traditional ceramics. Just a few miles west of Islamlar and Üzümlü sits one of the longest – and most impressive – of the Mediterranean’s beaches. A white-gold hem to aquamarine seas, Patara Beach boasts eight miles of coastal bliss backed by ancient Lycian ruins. In case the sunsets weren’t incredible enough. Such magnificence recurs around headland after headland, Kaputaş Beach being another star turn of the Turquoise Coast. However, for those looking to lounge by the waterside, cocktail in hand and leisurely lunches just a few steps away, make one of the numerous beach clubs around Kalkan and Kaş your waterfront destination. Turkish cuisine, both traditional and modern, revolves around meze: small portions of hot and cold dishes, usually vegetarian, served with dips and designed for sharing, as befits a culture where eating and drinking are intrinsically sociable experiences. Tomatoes, peppers, aubergines, yoghurt and olive oil are at the heart of many dishes, along with more distinctive flavours such as rosewater, tahini, fresh mint, parsley and dill. Desserts are invariably very sweet, combining pastry, nuts and honey for an intense sugary hit at the end of your meal. Breakfast is an important meal with bread, eggs, cheese, tomatoes, olives, yoghurt and honey all featuring on the typical family table, and going out for breakfast is an increasingly popular concept: be prepared for a banquet! Think of Turkey and you might think of strong, thick coffee, but in fact the most widely consumed drink is çay, served sweet and strong in tulip-shaped glasses. The cool yoghurt-based drink known as ayran goes well with pide (Turkish pizza) and pancakes, or go local with the pungent, aniseed-flavoured raki. Islamlar is where both locals and visitors come to enjoy traditional dishes, such as gözleme – thin layers of dough, with a savoury or sweet filling. It’s also famous for its fish restaurants where you’ll find mouthwatering freshwater trout, simply grilled to bring out the just-landed freshness of the flavour. If you’re staying locally, then an Islamlar garden breakfast is another highlight. The views are easily as good as the divine honey, yoghurt and fresh baked bread that will set you up for the day by the pool, exploring ancient sites or out on the water. Üzümlü means grape, and in and around the village you’ll see pretty vines adorning the houses and gardens. The hills and forests surrounding Üzümlü are popular with foragers, particularly those looking for morels, and the village plays host to a mushroom festival each spring. Down at the coast in Kalkan, you’ll want to have at least one meal in one of the many rooftop restaurants: chill with a pre-dinner drink and take your time over the menu as the sun slips below the horizon. Eating and drinking around Kalkan here is surprisingly cosmopolitan, with fusion food adding a modern twist to traditional dishes and smart cocktail lounges giving a sassier edge to the more typical waterfront experience. An impressive 12km stretch of golden sand backed by ancient Lycian ruins. This beach is also a protected natural park and a breeding ground for loggerhead and green sea turtles. Patara is a 15-minute drive from Islamlar and Üzümlü, and you can park near the beach. A small entry fee applies. Natural park status keeps the commercialisation to a minimum, but you can hire sunbeds and parasols. To protect the nesting Caretta Caretta turtles, the beach is closed between sunset and 9am. This picture-perfect half-moon beach is lapped by bright turquoise water. There’s a mix of sand and shingle underfoot and 180 steps to tackle each way, but definitely worth the effort. Kaputaş lies to the east of Kalkan, along the road to Kaş, about 15 minutes by car from Islamlar and Üzümlü. June to August can be busy here, so try and arrive early. There’s a small snack bar with sunbed and parasol hire during peak season. Big waves on windy days. Kalkan’s white pebble beach is gently shelving and a good choice for young children. The sea is tempered by a freshwater spring which empties out here, to the enjoyment of passing turtles. The beach is next to Kalkan harbour, about 15 minutes by car from Islamlar and Üzümlü. Parking is available on Kalkan harbourside. The location makes this a well-serviced beach with sun beds and parasols for hire, and everything else you might need in terms of eating and drinking available in Kalkan itself. Beach clubs are a Kalkan speciality, comprising a wooden deck or flat rock platform overhanging the sea. Ladders make for easy swimming access, and teens tend to love the club atmosphere. Kalkan is about 15 minutes by car from Islamlar and Üzümlü. Access to most clubs is via water taxi from the harbour. Simpson Travel guests have complimentary entry to the Indigo Beach Club, walkable from the town; entry fee applies at other clubs. A favourite with Turkish visitors, this shingle beach is reached by boat from Kaş harbour. There are four different beach clubs to choose from and a selection of good restaurants. Drive to Kaş harbour (about 40 minutes from Islamlar and Üzümlü) and take the free boat service. There’s a small charge for umbrella and sunbed use. The boat service runs in summer only, so check before setting out. This sheltered shingle cove is managed by the Kaş tourism college. It’s small but pretty with great facilities. The sea tends to be very calm here. Akcagerme is off the road between Kalkan and Kaş, about 35 minutes by road from Islamlar and Üzümlü. There are a few waterslides for older children (8+), a floating pontoon and a grassy area with peacocks and chickens roaming freely! Large car park. From Islamlar and Üzümlü you can tackle some of the celebrated Lycian Way, Turkey’s first long distance hiking trail. The path takes you close to some of the most impressive Lycian remains, including Patara. Best attempted in spring or autumn when the wild flowers and views are unforgettable. In fact, you can make this trip as calm or as thrilling as you like: cross the bridge and hang out on the hammocks over the water, or wade straight in and up to the waterfalls. At the mouth of the gorge, where the river widens, you can raft downstream on an inner tube. Xanthos and neighbouring Letoon are two of the most complete and yet least visited sites in all of Lycian Turkey. There are temples, tombs and amphitheatres to explore, and you might be the only ones there, apart from some sunbathing terrapins! Sometimes an air-conditioned car is the best place to be on a very hot day: take the scenic route between Kalkan and Kaş and enjoy wonderful views of the coast and the Greek island of Meis. Leave time for a wander round Kaş before you return. There’s an easy canoe tour along the Esen river that’s suitable for children aged eight and above. The trip takes about four hours, and you’ll paddle from Xanthos to Patara beach, stopping for a supposedly rejuvenating mud bath along the way. If you’re keen on photography and would like to shoot one of the ancient sites minus the modern visitors, Pinara is a good choice. Set amidst ancient olive trees in beautiful mountain scenery, the atmosphere is serene and the views are sublime. There are excellent fish restaurants in Islamlar itself, but for an alternative, drive north along the Kibris Canyon and enjoy lunch in a traditional lokanta at Gombe. There probably won’t be a menu, but the food will be homemade and delicious. Kalkan market is one of the liveliest in the region, selling everything from farm-fresh fruit and veg to designer ‘fakes’. A fun place to watch the art of selling and stock up on picnic goodies or barbecue essentials at the same time. For the traditional Turkish shave, we recommend heading to Kalkan or Kaş. This authentic grooming experience involves a cut-throat razor, singeing of stray hairs, nice smellies and face massage, all for less than the price of a couple of drinks back home. Ingilizce konuşabiliyor musun? (Ingiliz-je konusha-biliyour musun) Do you speak English? Ne kadar? (Ne ka-dah) How much is it? Labour Day, banned by the government for years due to fear of protests, have been back on the agenda since 2009. The highly patriotic Commemoration of Atatürk Youth and Sports Day, with performances from local children. Kaş Festival – a celebration of art, ballet and sometimes music in an ancient theatre, and a swimming race between Meis and Kaş. A three-day national holiday called Ramazan (Şeker) Bayrami: the Sugar Feast. Lots of sweet treats are enjoyed, children receive small gifts and cards are exchanged. Dates change every year. The eve of the Feast of Sacrifice (Kurban Bayramı), a four-day celebration of charity and compassion for the less fortunate. Dates change every year. Turkey lies on the migration route for many species of birds, and in May and September you are likely to hear and see jewel-coloured bee-eaters around Islamlar and Üzümlü. As dusk falls, the birds swoop and dive for food in impressive numbers over the villages and vines, a nightly show to enjoyed from your terrace, binoculars in one hand perhaps, and something perfectly chilled in the other. When high summer temperatures send even the locals into the hills for respite, you know it makes sense to follow. Bezirgan village sits on a high plateau, several degrees cooler than the coast; a visit here offers more than just cool breezes however, for traditional hospitality reigns supreme, and you’ll be warmly welcomed in the tea houses, and quite possibly plied with gifts of local produce. Early risers are in for an unforgettable experience at Kalkan beach. If you can make it to the water before the sun hits the beach you should be rewarded by green sea turtles surfacing occasionally for air, and brightly coloured kingfishers skimming the water in search of their breakfast. Underground springs cool the sea close to Kalkan, making for a uniquely refreshing start to another glorious day. This part of Turkey is littered with Lycian ruins, and most visitors barely scratch the surface. The walk up to Delikkemer from Patara is a bit of a rough scramble in places, but worth it to see the extensive remains of the huge Roman-built aquaduct that once carried mountain spring water to the cities. Encircled by peaceful olive groves, it makes a wonderful picnic spot.